I have been pagan, of one description or another, my whole life. Like so many on this starlit path even before I knew the name of “it”, I knew “it” was my home. My belief structure has run the gamut from polytheist to pantheist, panentheist and animist. It is one great big internal mosaic that informs how the Divine colors my world. Like everyone else on this great spinning sphere I have my mundane tasks to attend to. I am Wife and Mother I have a ‘day job’ and I live my spirituality as a vocation as well. I have been studying witchery a very long time and at this point some part of that makes its way into everything I do. When in the beginning of my magickal studies I would go to great effort to maintain lengthy devotionals and keep to a rigid ritual format, I have lost all desire for such pomp and circumstance. Everything is much more instinctual now. My day begins with a quick prayer to the Sacred Divine to keep my family safe and happy throughout their activities. I intuitively sense what my loved ones may need extra help with that day and throw an added bit of energy toward that. This takes maybe all of five minutes where once I would have spent an hour. Cleaning for me is not just ridding my home of dust and germs but also the clearing away of stagnant or negative energy. Cooking is not just part of feeding the bodies of my family and me but a way to imbue blessings and magick as well. A sprinkle of this and a dash of that and a clockwise turn of the spoon to swirl up a healing essence of what will become a meal, is what happens when I’m in the kitchen. If I have had a stressful day I know that a few minutes spent with my back against a tree or my bare feet upon the earth is a surefire way to find my center again. Being in a natural setting feels as if I am a piece of a puzzle being fit into place. It reminds me that we are all connected eternal beings and that we are more alike than not. I feel the harmonizing peace that is imminent in all that is and I know that that is the truth of existence. Everything else, love, money, happiness and more, are expressions of this. Like so many Pagans and Witches of many varieties, I have an altar. When I started working with Divinity as a whole essence rather than as different beings I stopped using images of Gods and Goddesses. It’s not that I have closed off my mind to the belief in Deities. It’s more that I have come to believe that ‘they’ and ‘us’ are all part of the same whole. This, strangely enough, allowed me to open up to valuable and healing wisdom from other beings, such as Saints and Angels. My altar today has references to things that are specific to my life and to the elements and my ancestors and all of it is a part of me and we are all a part of what I have termed the “Sacred Divine.” It is that essence that I work with now. This is by no means the be all and end all of ‘Pantheist Witchcraft’ it is just how I am working it on my journey. 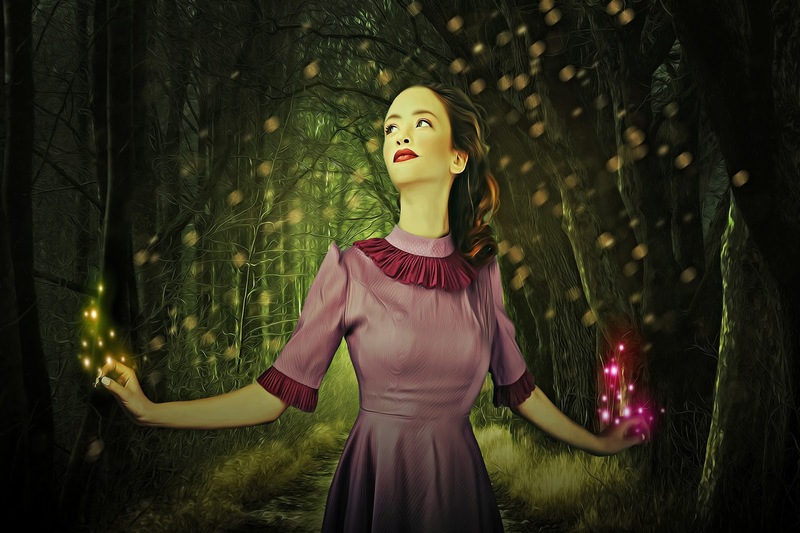 It is this journey that has helped me realize the biggest secret to a witches power that seems so obvious and is yet so simple: Magick is within. It's not out there somewhere. All the spell ingredients and ritual tools in the world don't mean a thing until you tap into your own power, of which there is an endless supply. Do you think of yourself as a Pantheist Witch? I'd love to hear how you work your magick in this world! Talk to me! A very vivid description of "a day in the life of..." I enjoyed reading your post!